Hello. In this guide I'll show my ways how to play Feral Druid in Hybrid, which is essential for Ragnaros progression, due to it's raid utility and flexible playstyle, allowing players to always change something, and yet stay relevant. -Ferals might struggle a bit with catching adds that are far away for them. Their only tools to do so is Faerie Fire and Growl. Prime Glyphs goal is to increase your Damage Output, through supporting your cat form spells. On fights where you can't use Shred at all, glyph of Mangle is also a decent choice, increasing your filler damage, which could make up for lost Rip ticks. Major Glyphs are only player's preference, though Glyph of Rebirth is the only "must have". Minors Glyphs, as always do not affect your playstyle, and you can choose whichever you prefer. Feral Druid is based on priority style rotation, so you don't have to blindly press x 3 times, then y once, and repeat. Key role in Bear's spells is played by Mangle cooldowns refresh from Lacerate and maintaining 9% Critical Chance from Pulverize. It's also useful to switch targets with Tab and apply on each of them at least 1 stack of Lacerate, for free Mangle procs, and additional DoT generating threat. Huge addition to Feral toolkit are flexible raid cooldowns. They make Druid great support, doesn't matter which spec he's using. Preferred way to play druid is to change stats, dependant on use. There are statistics better and worse, but remember that even as tank stamina is inferior to everything else. It's also worth mentioning how Bear's mastery work, and why it's important. It simply improves absorbs from our Savage Defense ability, which has 50% chance on Critical Strikes, to give 35% Attack Power as absorb, lasting for 10s. And what mastery has to do with Savage Defense? It greatly raises absorb digits, making Bear fine choice for taking physical damage. Apparently Mastery despite being favoured by T13 2p, loses LOTS OF value under 65% of Boos Health Pool. This way, Haste>Crit>Mastery is still prefered playstyle, which actually gains a lot from Kyroptyric Sigil passive haste, and huge ammounts of agility on use . 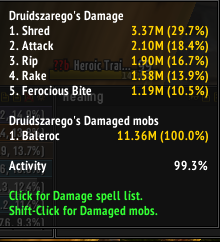 Druid Feral doesn't have big choice in terms of consumables. The best choice is to maximize your Agility, because it's what makes Bears so great. Professions are just a matter of someone's preference, however some of them are inferior combared to others. Disclaimer: Starcatcher Compass vs Matrix HC results may still vary, due to how Compass will work on live retail post release. As Feral you will usually go up. Remember that you can AoE taunt the Spinners, so they come down from theirs' web. Don't be afraid to use Tranquility in second phase, but before getting boss on yourself once again, get into bear form and stack some Savage Defense absorb. When tanking the boss, remember to use your Movement Speed bosts in order to drop Jagged Tear stacks. Wait with berserk until second tank runs away with dogs, because holding aggro of Riplimb and Shannox might give you some nasty bleeding. Always pick up Fragments of Rhyolith, so other DPS can easily AoE them down. If you have to steer the boss in cat form, remember to maintain 100% uptime of Savage Roar buff, and attack legs ONLY with Shred, Rake and Ferocious Bite. Always on the beggining of fight, try to interrupt the first Blazing Talon Initiate. It will let your DPS to save interrupt for other Fieroblasts. Try to support healers on Firestorms, share Stampeding Roar happiness with your fellow raid members, and use Feral Charge to get to your side quicker (If there are any Initiates left, of course). When DPSing, taking first Shard of Torment will be your job. Be prepared to take it without any switching. Use your Barkskin around 8th stack, and Survival Instinct around 15th. If you're a tank, always use Barkskin 8 seconds before Inferno, or Decimation Blade. Additional 12% of Dodge will greatly raise your avoidance, and in advance you will be able to dodge some nasty hits. Scorpion phase brings nothing in particular for ferals. Hold aggro, use cooldowns, don't leave bear form, and just throw in Stampeding Roar when spreading. The best way to catch Spirit of the Flame is using Growl+Faerie Fire+Maul in the same moment. Remember that Spirits often deal more damage than boss, and if DPS can't manage to handle them quick enough, just rotate your cooldowns and communicate with healers. Our favourite Firelord is the reason, why Ferals are so essential for Firelands. Always begin 1st phase in Cat Form, and DPS until the other tank asks you to take the boss. Don't bother with finding position to shred, just play it safe. After initial burst in Cat Form, you will switch on 4-5 stacks of Burning Wound, or when debuff drops, depending how you communicated about that with healers and other tank. The best way to handle Transition Phases is bear form. Open your Son of Flame with Faerie Fire+Mangle+Maul. Then Lacerate+Maul, until your Mangle refreshes. Thrash is also a great addition, because of bleed. If Son of Flame comes too close to Sulfuras, just Feral Charge or Skull Bash to it, and stun with Bash. The second phase will begin with other tank, so once again you can get back into Cat Form and scratch Ragnaros a bit more. Remember to have enough Energy/Rage to use Stampeding Roar on 1st and 3rd pack of Molten Seeds. On Second Transition phase you grab your Lava Scion with Growl+Faerie Fire, and apply Lacerate on it. Why? Because it can refresh your Mangle, so it will be easier to handle Son of Flame, and stack Lava Scions earlier. Usually the other tank will take both Scions, so as Feral you just have to go Cat and Bite them until they fall. 3rd phase is a pure DPS check. The other tank, usually DK or Paladin will stand on one side of platform, and tank the boss alone. Your job in that moment is to stand on the other side, and do as much damage as you can. Tiger's Fury, Berserk, Rake, Rip, Shred, etc. After you push him into 4th phase, try to cast Stampeding Roar on as much people as you can, in order to make going into Breadth of Frost faster. Once you get on your position, support healers with Innervate and Tranquility. When kiting the boss into Entrapping Roots cast Growl+Faerie Fire, and run as fast into them as you can in Cat Form, preferably with Dash enabled. Once boss is in Roots, and your Superheated starts rising, get back into Bear Form. Start the fight stacked with melee DPS. When he summons first Void of the Unmaking go a bit to the side, so Psychic Drain hits only you, reducing raid damage taken, and health restored by the boss. After raid is done with bouncing, and Zon'ozz starts applying Black Blood of Go'rath stack with everyone in order to make healing easier. Tank the boss preferably in the middle, when globues come out switch into cat form to help with DPSing them down. Remember to keep your cooldowns for Void Bolts, since they might hurt on higher ammount of stacks. Cat Form isn't different than other specs in terms of "rotation". Making it priority based forces player to pay bigger atention to what he clicks, and when he clicks. As Feral PvE you have only 3 Finishers, Rip, Savage Roar and Ferocious Bite. Savage Roar is so essential, that it's reccomended to use it even at 1 Combo Point. Rip is a strong bleed effect, prolonged with your Glyph of Bloodletting, so you have a bit more time for using your energy for something else. You should apply Rip always on 5 Combo Points. Around Boss 25% Health Points try to apply as strong Rip as possible. Ferocious Bite is instant damaging spell, dealing damage dependand on your Combo Points and ammount of Energy you currently have. With talent Blood in the Water, you will refresh your Rip, if target is under 25% HP, which makes Feral great DPS for later on, and is a valid excuse for keeping your Potion of Tol'Vir until boss Reaches ~25%. Mangle is viable filler ONLY when you can't attack target's back or when you have to refresh your Bleed Damage debuff. Otherwise Shred, compared to Mangle deals way higher damage, and has it's damage increased from Bleed Damage debuffs. 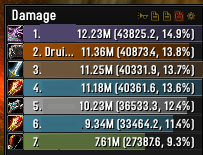 Feral DPS does have only 2 Offensive Cooldowns. Berserk in Cat Form reduces all of your energy costs by half, making maintaining bleeds and Savage Roar way easier for inexperienced players, and greatly increasing burst damage. Tiger's Fury is 15% Physical Damage increase, and 60 Energy regeneration with King of the Jungle talent, which is essential. It's worth noticing that you CAN'T USE TIGER'S FURY DURING BERSERK. Keep your second potion until 30% - 25% of the Boss. It will allow you to leave higher Rip on target, and then simply refresh it with Ferocious Bite. Under 25% of the Boss, refresh Rip with Ferocious Bite. If your Rip is about to fall down, and you don't have 5 Combo Points ANYWAYS use Ferocious Bite. Make Bleeds and Savage Roar visible by using Power Auras, or any other tracking addon. Having control of those is really important. And the most important thing, practice! I played a lot of specs during my WoW "career". Some were easier, some were harder, but in my opinion, Feral amongst all of other specs is the most punished for players not practicing at all. You really have to understand your energy, which is accomplished by trying all the time to improve yourself. When you know that you won't be able to cast 3rd Berserk during encounter (for example on Baleroc), use it when Boss gets under 25% Health. When your desired target reaches ~24% HP Mark, use your Potion of Tol'Vir, Tiger's Fury, Berserk, apply Rip and spam Ferocious Bite on 5 Combo Points like crazy (of couse remember about Savage Roar and Rake). As you can see in following screenshots, that way to DPS as Cat is very reliable, although requires lots of practice from you to execute it on at least decent level. Because I'm a noob who doesn't use much macros. Neat macro for trolls, Now your utility tranquility is even faster! 19.09.2017: Fixed several glyphs mistakes, changed BiS list for offtank/hybrid. Added MYSTERIOUS poll. That's all from me (at least for now). I'd like to thank to everyone who encouraged me to write this guide, Mogromir in particular, and to Notosiup for teaching me how to play Feral for progression. Also huge props to Padthai, for encouraging me to write Cat Section, and Polaroid for huge ammount of useful macros! If you did enjoy this guide, please answer my poll: Would you like similar guide to Feral DPS? If yes, please tell me in the coments, what should I improve next time. Also, if you have some tips or remarks, feel free to respond. Let's make Feral great again! 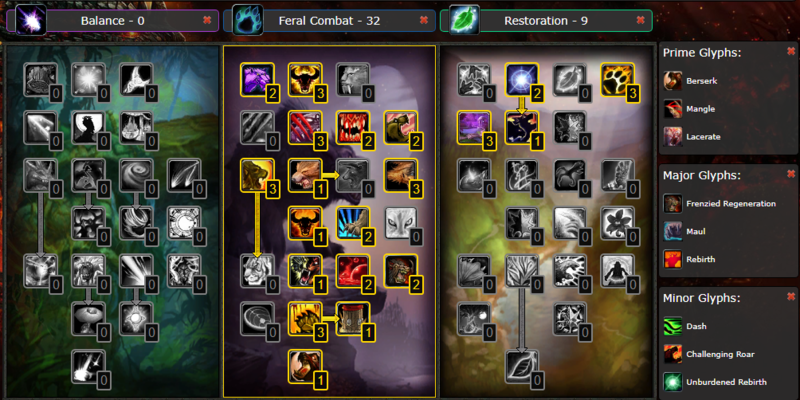 Isn't "Feral hybrid" is just the same as Full Cat Haste build with only changes in the Talents. Thick Hide & Nuturing Instincts to able to taunt Ragnaros and not dying later when you switch to Cat back. I saw the talents picking "fluffy hybrid" I dont see reason to pick Pulverize & Primal Madness at all. Btw nice guide pretty fine (I did not read everything only till like Talents) I will edit later. Thanks for your opinion! Honestly, I find myself uncomfortable without Pulverize, but I definitely have to try it someday. And Primal Madness is also debatable choice, on some fights it's rather irrevelant, but I'm mainly using these talents for all fights (Not only Rag HC), so that's why some choices are weird. Good initiative on the guide. You gonna add a DPS section for when the player is in cat and not bear? Especially when you're stuck without rip/bloodletting as your Primes. Interested parties could prolly check another cat DPS guide but you could add a section here for continuity sake. Edit: Added short Cat Form Guide, as Padthai suggested. I'm aware this might lack a lot of information, but let's improve this guide TOGETHER, as Atlantiss.eu community! Overall solid guide, +1 from me. Hope it helps ppl play feral a bit better since good ferals really are pretty rare. edit; A thing people seem to struggle with when playing the hybrid spec is to effectively use most of your other spells, this goes for spells from both bear/cat and caster form. An example on how to make a macro's for each form could be a nice addition. I'll post some of my macro's when i get the chance. I've made my macros around the idea of having both bear and cat on a specific button so it's easy to switch at any time. So apart from the bear and cat macro most of them are made to have 1 keybind for different spells depending on the form you are currently in. This way I got all important spells on a keybind without it getting really cluttered. Catform: used a 2nd time makes you enter prowl and cast Pounce when stealthed. Bearform: when used a 2nd time will pop frenzied regen, a good OHSHIT button for any druid spec. Survival instincts: just cast normally when in cat or bear, but will pop bear + SI when in caster form. Berserk: this is mostly to make sure tiger's fury doesn't get wasted. Added troll racial and bear's Enrage to boost dps. 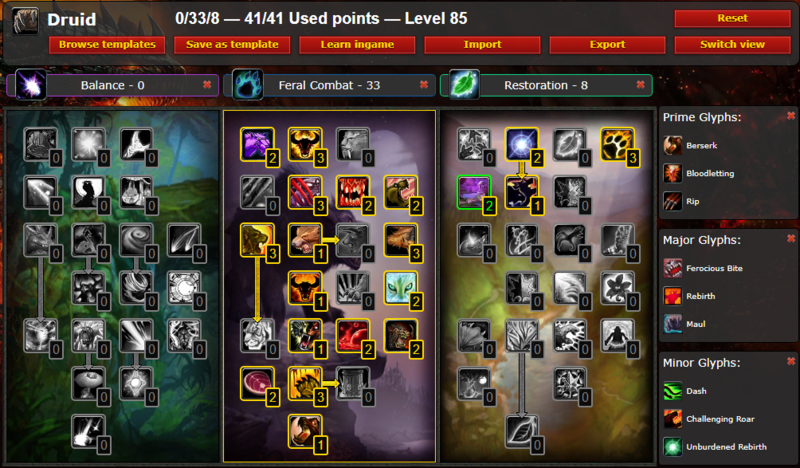 The following macros are the '1 button 4 spells' category. If you got a boomy or resto offspec you can add spells for this the same way, just add another line with '/cast [stance:5] Starfall' for example. So yeah. those are the macros I use for my feral. There are other ways to go at this and this is in no way the perfect solution for everybody, but it should give an idea of whats possible at least. Thanks! Feel free to do with them what you want really, it's why I posted them after all. Mess around with them, replace spells for others that make more sense together for you etc etc. That's how I ended up with my macro's in the first place. 1. Infected Wounds is a must for me. Most battles dont require two tanks (Baleroc, Majordomo), other fights don't always allow tanks to stand near eachother (Beth, Alysrazor, Shannox). So if the second tank doesnt constantly keep this debuff up for you or you dont have a second tank you are taking 20% more physical DMG. 2. AoE Rotation - Thrash + Swipe + Glyphed Maul when you have a lot of rage. Also having lacerate on every enemy gives you a ton of free mangles. Just keep pressing TAb and spam Lacerate, but Thrash and Swipe are the most important, make sure to always have enough rage to use them. 3. Cat Priorities - Remeber as a cat don't spam buttons, you can stay around 50% of energy all the time, no need to be at 0 all the time. Make sure to use ALL clearcasting procs on Shred. Under 25% of health you no longer use Rip in your rotation since Ferocious Bite refreshes the Rip. Remeber about snapshotting your bleeds. ALWAYS refresh bleeds just before your procs end to have the whole DoT benefit from the bonus. Tiger's Fury is very important also, remember to be at close to 0 energy when using TF to not overcap energy, also remember to refresh all Rip and Rake 1-2 secs before Tiger's Fury ends to have the bleeds deal 15% more DMG even after you no longer have the Tiger's Fury buff. 4. Getting the most out of Bear Absorbs - remember you don't need to always spam all skills on CD. I for example wait with using mangle / maul / swipe / thrash when I see I have an absorb already on me. As soon as I get hit and the absorb goes off I do a mangle / maul / Thrash combo giving me a high chance of getting my absorb back right away. 5. Glyph of Barkskin - this glyph is PvP only, so it's useless if you dont plan to play some PvP after finishing Firelands. That's all for now, if I see more I'll add another post. Good job with the guide. The trick is, to Charge in Bear, and quickly swap into Cat, for additional 30% haste. This is so not worth. You end up losing DPS when you swap forms to charge and after staying in bear for longer time(if you drop tigers fury)you have minimal use of it.Better remove it from guide. One tip for Alysrazor, you can kill birds much faster if you open on them in cat form(set bleeds extend Rip with few mangles if you get some crits you can use FB as finisher but only if you know that bleed wont kill bird until you get both worms)then you can help other tank to kill his bird or help with adds on side. This can make fight much more interesting for feral. PS. notify your healer that you will be in cat form and use barkskin (survival is needed only if you are taking damage from other sources beside bird). Good guide, with good tips. But I'm using a little bit different talent build. I mean with free revange after charge. Replacing Thick hide (2/3) and Perseverance (0) talent for mentioned charge. U takin a little bit more dmg (which wont kill u), but have 1-2 more combo points per 25s + some dmg. Of course for fights like Ragnaros, when u can't charge cd after cd it's not that good. 50% of the fight u can't use a charge, but still I think it is worth enough. A specially on hammer adds. It's not bad idea IMO, but if u focus on mastery completly u have also more advantages in bear form. So I prefer to stay mastery hybrid feral. I'm not huge fan of ravage on hybrid. It might be decent, instant damage, but I prefer bear form to kill adds (Because of mangle resets and during second transition you also have to hold Scion, which hits pretty hard on heroic). Also on several "patchwerk" style bosses it requires from you to run away and waste 2 GCDs in order to have effect, making it actually not worth using outside of opener, because of the melee swings wasted during that time. Also recently I'd been trying mastery hybrid. It's as good as haste, and gives player higher error margin in Bear, while also increasing skill cap required for Cat (While reforgin in haste it's opposite. Higher error margin in Cat, increased skill cap for bear). Thank you very much for the contribution! Well, I'm managing my energy to run away and jump when I can't use other abilities. This few melee swings is still a little bit lower than 1 hit by revenge + it build some combo points which is advantage. Tried it in every encounter, even on dummies and always had higher dps. Sometimes just slightly, but still. I've also hybrid tanked Ragnaros HC. I've taunted scion + FF him + mangle sometimes and roar to get out of Scion's range and then transformed in cat form and jumped on further adds letting Scion came to middle of the area, where DK's taunted him and letting me focusing on dps. That was my tactic. But even without it, 1 less point of Thich Hide talent (on many tries) wasn't let Scion kill me. In case of high dmg I had always any of CD's to use. Shameless bump! There's been one of the biggest updates since release. Talents section had been reworked, same as Hybrid Best in Slot list. Also I'd also love to get some feedback to the poll included in the beginning of the guide. Thank you very much for everything in advance! Stay furry!